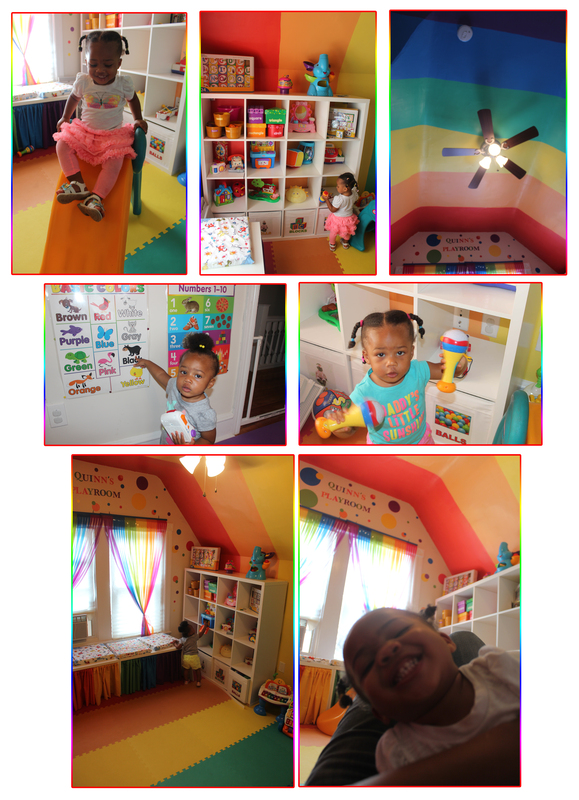 The Ultimate Playroom for a Colorful Child: School is in Session! Jim Greenman, author of Caring Spaces, Learning Places, says, “Children deserve to spend their days in well-designed environments that support their needs and stimulate their learning.” Though Quinn, my sixteen month old daughter, is not in an early childhood education setting, she certainly deserves to have an area that is not only rich in play and teaching but a place she can call her own. 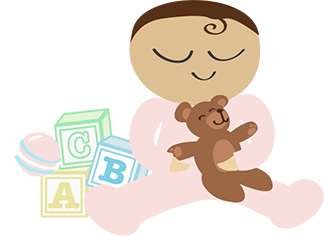 I am extremely grateful that my husband and I have accommodating work schedules so that we do not have to put Quinn in daycare; however, there are some benefits that come along with such educational environments. For the past few months I envisioned, designed and set up what I consider to be more than a playroom for Quinn but the ultimate learning environment. This area will be constantly evolving as she continues to learn and grow, but at this point, watching Quinn’s face light up and hearing that giggle every time we enter her room melts my heart. So I thought, why not share some of my playroom ideas with other parents looking to create a special place for their children. You may click on the photo below to enlarge it. 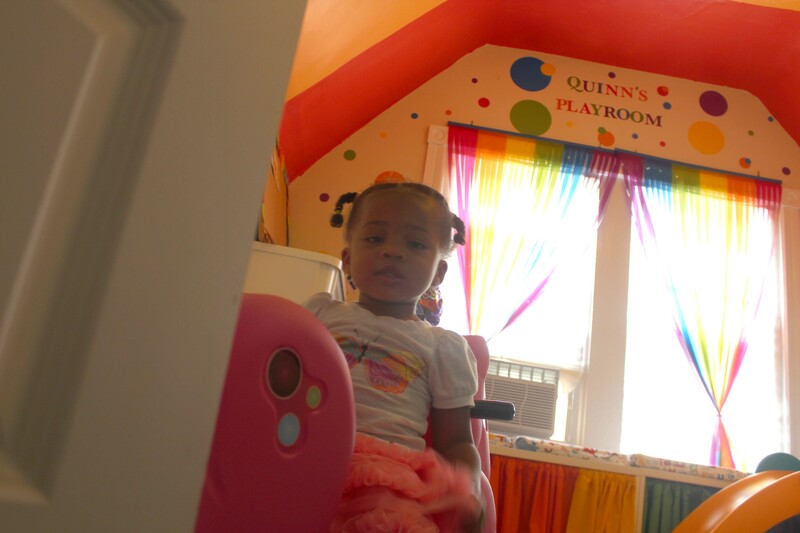 Colors: I envisioned a colorful, fun place that would brighten Quinn’s mood even when she may be a little grumpy but also reinforce learning, so I went with a rainbow. Rather than paint the four walls, I focused mainly on the ceiling and had the rainbow come down one side of the wall with the shelving unit. Sometimes, we actually lie on the floor, which consists of corresponding, colorful, cushy floor mats (purchased through Amazon.com), and look up at the ceiling as she points to the different colors. Quinn enjoys looking at the different size circles and “Quinn’s Playroom” which are actually decals that my sister thought I carefully painted myself (also ordered through Amazon.com). Toy Storage: Instead of having a traditional toy box, most of Quinn’s toys are on display in a shelving unit purchased at Ikea to encourage her to reach for the ones on the lower shelves and to put them back exactly where they belong. On the lower shelves, I have Ikea storage boxes with the pictures and names of the objects which I added with iron-on labels, to promote reading and sight recognition. I also included a seating area with comfortable Dr. Seuss cushions I made for adults visiting or activities for Quinn. This area doubles as storage behind the colorful curtains I made with fabric purchased from Joann Fabrics. Educational Toys: A playroom isn’t an effective playroom without toys but not just any toys: toys that promote learning, physical and cognitive development. Lakeshore Learning, Beckers as well as Amazon.com were some of my go-to places. Of course, every toy and activity is not for every child, but I do plan on providing follow-up blog entries on which toys Quinn loves and are really engaging her in the learning process.